Virat Kohli has won the toss and chose to field. 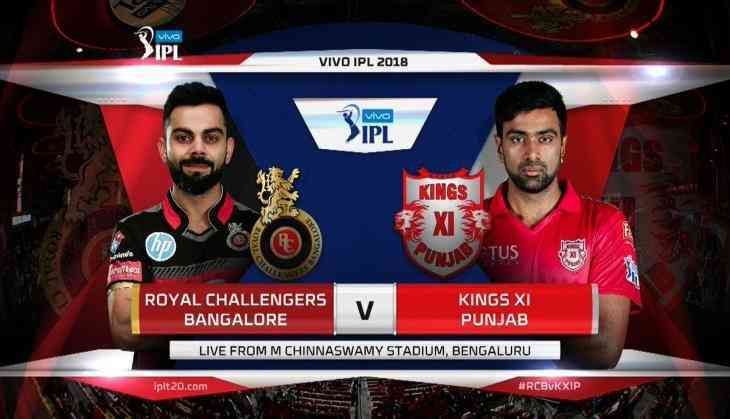 Royal Challengers Banglore and Kings XI Punjab are going to clash today at 2000hrs(IST). Both the teams are studded with star players like Virat Kohli, AB de Villiers, Chris Gayle and David Miller. Virat's army has all the crucial points checked and the main points under control when it comes to the batting, bowling and fielding departments. However, Kohli's tryst with IPL has continued in the IPL and the team is still looking for their first win in the league. Moreover, Punjab comes with the power hitters like KL Rahul and Chris Gayle and they have the ability to come up with the explosive performance anytime. The last match of Punjab has seen that happening that got KL Rahul hitting the ball so hard he ended up making the fastest ever IPL half-century and that ultimately cost the opposition dear. However, each match comes with a different approach and Kohli's army would put its best to get the best out of the match and register their first win of the tournament. Ravichandran Ashwin (C), Akshdeep Nath Mayank Agarwal Mayank Dagar Ben Dwarshuis Aaron Finch Chris Gayle Manzoor Dar David Miller Mujeeb Ur Rahman Karun Nair Axar Patel Lokesh Rahul (W) Ankit Rajpoot Pradeep Sahu Mohit Sharma Barinder Sran Marcus Stoinis Manoj Tiwary Andrew Tye Yuvraj Singh.